good but didn't give me the chills. Like probably every other self-respecting mountain biker on earth, I watched Strength in Numbers yesterday. I plugged the old lappie into the flat screen at sat back with some popcorn to watch it in all its sometimes-pixelated glory. But who can complain? I was stoked Anthill was letting the world check it out for free. And why not? If you're proud of your creation and you know it's top notch, why not let people check it out and trust that they'll buy it? So for any of you who were living under a rock or recovering from a coma in a hospital or whatever, here's a little review. I have to say up front that Strength in Numbers is a good movie and probably deserves a place in anyone's collection. But since the Collective/Anthill guys are pretty much the standard by which all MTB movies are judged, I'm taking a pretty critical approach. I only got to watch it once, and maybe after a second viewing I'll come back and change all my failed opinions. But these are my initial impressions. I was hoping for a little more. For me, it was just good. It lacked the soul of Roam and the stoke factor of Follow Me, and sits somewhere in the neighborhood of Seasons. Follow Me, while pretty straightforward, had some pretty mind blowing moves on some really crazy features, and maintained a really high energy level that still gets me really stoked to ride. Like Seasons, it wasn't enough of a documentary to be really interesting, but it was enough of a documentary to slow things down and be uninteresting. I'd love it if they did a full on documentary of some of these guys and their lives. But this halfway stuff just doesn't do it for me. Either dig deep and really show us what it's like behind the scenes, or just give us the eye candy. Anthill always seems to mean well conceptually, but it ends up being like the little brother in the back seat while you're with your friends, popping up here and there and bugging everyone. Other than the Kamloops section where Aggy rides that huge jump trail through the woods, I wasn't blown away by the amplitude of anything. Don't get me wrong, there were awesome moves and awesome trails, but I don't remember seeing really ground breaking. I was impressed multiple times by the speed and control exhibited by downhill and trail riders throughout the movie. Brandon Semenuk rallying Gnarcroft (I think?) is something to behold. Strength in Numbers seemed to be less hucks and tricks and more high speed, gnarly line choice. It definitely made me feel like a hack of a trial rider. Those moments are scattered throughout and they're probably my favorite thing about the movie. As I said earlier, it was good. They had some pretty awesome ultra-slowmo stuff going on, and they used it really well. It appeared consistently but not to the point of being annoying. I also noticed some impressive long shots of DH racers. It's seems like those are rare and Anthill managed to get some extended lines that really showcased what some of these World Cup blokes can do. On the other hand, with Redbull on board, I had secret hopes that we would see something on the caliber of Travis Rice's snowboard movies like That's it That's All or The Art of Flight. I guess Redbull wasn't the only source of money for Travis. We'll have to wait for Quicksilver to get in on MTB. But after Lifecycles, which although it wasn't perfect and was maybe a little too ambitious, I think Anthill needs to further step up their game visually. I know a lot of people didn't like Lifecycles for a number of reasons, but I LOVE watching it. It's amazing to watch. Strength in Numbers was good to watch, but not amazing. Without going back and checking out all the songs again, some highlights for me included Rage Against the Machine (gotta give credit for the stoke factor during the Utah segment), the Bouncing Souls (nothing like some classic punk), Imagine Dragons, and the Jezabels. Lowlights included Shocking Blue's Send me a Postcard during the Aptos portion. I get it, they're the Post Office Jumps, and the song is about sending a postcard. Nice idea, horrible song. Cantara, by Dead Can Dance, was a tune clearly picked to match up culturally with the Nepal segment (although the song has more middle eastern flavor than Asian). I'm all for a little culture, but it went on forever and actually started to bother me before it was over. I guess everything else was pretty forgettable. I'll have to go back and check out the tracks to see if there's anything else I liked. Lots of gritty, mid-tempo rock if you're into that stuff. I happen to like electronic music, although I don't think the whole movie should be drenched in it, but Shave It by Zedd didn't get me going. I liked the integration of the random locals during the Whistler segment. Super cool for them and nice to see good riders who don't do it for a living. I liked the bike related quotes between segments.I liked the old footage from early days at the Post Office Jumps. When I mentioned a full blown documentary, that's the kind of interesting stuff I'm talking about. I liked the section where they showed the trail-builders by their trails and with the trail names. A Danny Macaskill segment would've really added some umph to this thing! I don't recall Matt Hunter out-doing any of his past hucks, and that hurt a little. I'm utterly glad these guys keep making movies. I love it. But I'll probably buy the iTunes version at half the price of the DVD/BluRay. 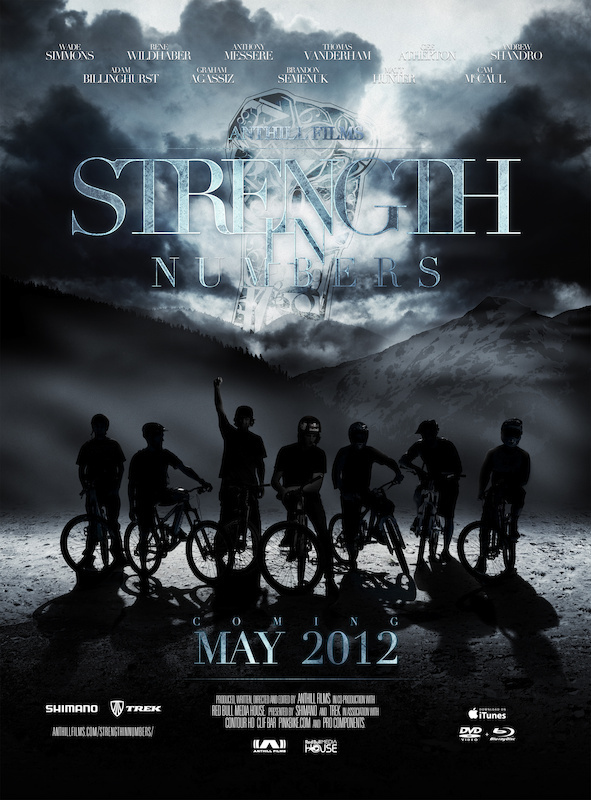 Strength in Numbers can be ordered on DVD/BluRay here or downloaded on iTunes here. I missed the stream, it was a tragedy. Anyway, I figured that it wouldn't be as much of a documentary as I wished it to be. My first Anthill film was follow me. Outside two or more riders shredding at the same time it was just really wonderfully shot eye candy. Anthill really has the talent and potential to make a movie that tells a great story and captures some great riding footage. I just hope to see it happen soon.